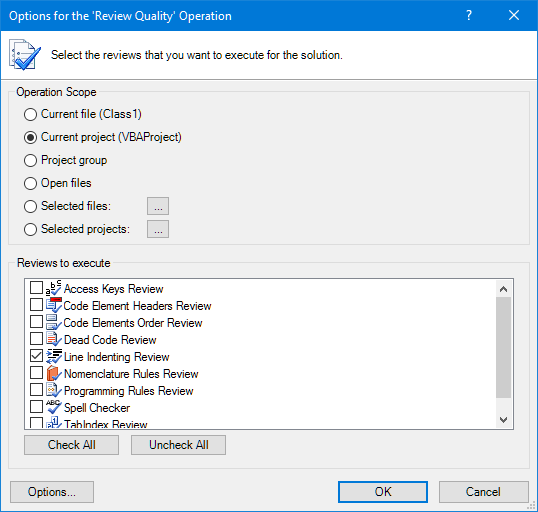 In build 8.0.0.70 (May 1, 2016) two new features have been introduced: a line indenter and a line indentation review (part of the Review Quality feature). 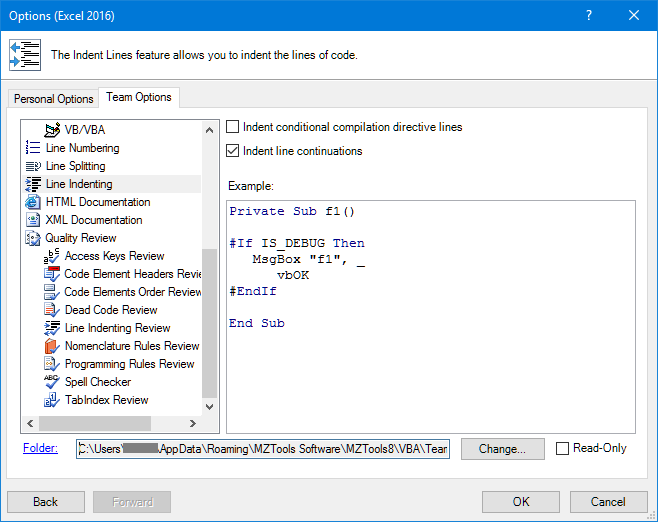 The line indenter works without additional dialogs if the cursor is inside a method, or otherwise it shows a dialog to select the scope (project, file, etc.). Handy menu entries in the context menu of the Project Explorer are also provided. So, with these two new features you can be more productive, get your code more formatted and you can increase the quality of your source code. This entry was posted in Moving from MZ-Tools 3.0 to MZ-Tools 8.0 by Carlos Quintero. Bookmark the permalink. Yay! I didn’t realize this was your most requested feature, but it makes sense. Since Stephen Bullen’s addin no longer seems usable in Excel 2016, I had thought how great it would be if MZ-Tools filled the gap. So thanks very much. There’s one thing that I miss in your version: the ability to keep it from indenting the entire code body. I don’t the code itself and just rely on spacing to identify the beginning and ending of subs, functions, etc.